Happy Friday everyone! Hope you're all excited and off to a great extended Memorial Day Weekend. I'm super looking forward to spend an extra day off with family and friends and have some major fun in the sun and water, while indulging in all kinds of hearty foods with no discrimination. Yesterday was already an incredible start to this weekend because Kyle and I planned a Gatsby-themed date, including dressing the part to see the movie. Kyle looked dashing in a pin-striped suit with a vintage cashmere scarf and a handsome paisley-printed tie, while I went with this vintage-inspired floral dress from Reformed by Reformation because I imagined a Daisy Buchanan sitting under the shade of her wide-brimmed hat, spectating her husband Tom at one of his grand polo matches. This dress is such a dream with its strategically placed slits, creating a long, flowing train of lightness that follows with every step. I can surely say, by far, this is my most favorite dress I've ever worn in the entirety of my life, and I can make that statement as simple as that, because I just feel it. it's beautiful! you look so perfect! i looove this! This reminds me of a dress Vanessa Hudgens wore! So pretty! Thank you! I think it is the same dress she wore haha. beautiful!! urban outfitters has gorgeous dresses. Love this look! That dress is amazing!! After I saw this dress in your previous post where you posted a picture of the dress to instagram I went out and bought it for my graduation! I tried it on in store and it was so beautiful, definitely flattering on any body shape :) Thanks for showing me this gorgeous dress! This has become my favorite dress of yours so far! I absolutely love the print and how it's cropped/cut out! Love your dress. Soo stunning!! i love your dress, it is so gorgeous! That dress! Those shoes! So cute :) my boyfriend and I had a dress up date to see Gatsby too, way more fun that way! I loved the movie! Thoroughly enjoyed it, great interpretation of the book. I honestly am dying to see Star Trek, heard how great it was! Hah, I have a post with this dress coming soon. LOVE it, so stunning on you. Your dress is stunning! Loving the floral look. New follower, lovely blog dear. The dress is beautiful! You loook amazing in this outfit! You need to show both of you two together in the outfit! Thank you Cassandra! I really wish we did take a picture together, so fail. Amazing dress! And those heels are to die for! wow really amazing dress! love the print! You look so gorgeous in that dress & those shoes are such a classic. You look gorgeous! I was wondering which size you got because I am unsure whether to get XS or S! 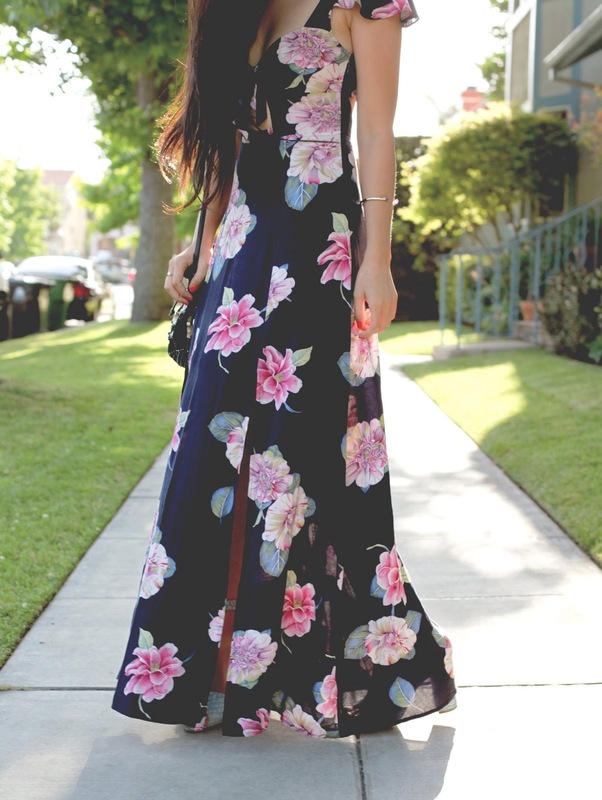 This dress is just stunning on you and the shoes were a perfect choice. I adore this dress and have actually been searching for it for quite a while, would you consider selling it?